Government is doing everything to allure people towards NPS. Recently, NPS account opening form has been cut down from 6 pages to 2 pages. Subscribers opening account through banks are not required to furnish KYC (Know you customer) details, if it?s already been done by Banks. Also, in budget 2015, an additional deduction of Rs.50,000/- is made available for contribution towards NPS u/s 80CCD. This made people inclined towards NPS but there was one more change which had to be done to rope in the interest people to open NPS account, i.e. Relaxation in NPS Withdrawal Rules. NPS did not allow any withdrawal before the retirement age of 60 years which made people to stay away from including NPS in their retirement portfolio but now, this much awaited modification in the withdrawal rules of National Pension System has been done. The harsh rule of National Pension System (NPS) has been amended to allow partial withdraw up to 25% of contributions. Subscribers will be able to make partial withdraw in specified emergencies plus flexibility has also been made in the exit rules. Let?s understand the modifications in detail along with the basics of National Pension System. NPS (National Pension System), similar to the US retirement scheme- 401(K), is a Government approved defined contribution pension scheme which requires a minimum contribution of Rs.6,000/- per annum till the age of 60 years. While state and central government employees have to compulsorily subscribed, it is optional for others. The minimum contribution of Rs.6,000/- can be paid at once or in installments of Rs.500/- per month. NPS currently offers three funds to invest: government securities fund, fixed-income instruments other than government securities fund and equity fund. Maximum of 50% can be invested in equity through index funds. At the age of 60 years, you can take 60 percent of the account balance as a lump-sum and rest 40 percent should be used to buy annuity which gives you periodic pension or fixed income. As already stated that no partial withdrawal was allowed from NPS, but post-modification of the rules, you will be able to withdraw up to 25 percent of the contributions. The point to note is that the limit of withdrawal of 25 percent will be calculated on the contributed amount not on the account balance. Suppose you have contributed Rs.5,000 per month for 10 years, you would be eligible to withdraw Rs.1.50 lakhs i.e. 25% of Rs.6 lacs. In case of employees provident fund (EPF) you are allowed to withdraw a portion of account balance for specified emergencies. Read: EPF vs. NPS? Which one is Better? Further, partial withdrawal can only be made if you have made contributions for minimum of 10 years and only 3 withdrawals are allowed that too in a gap of five years between each withdrawal. The specified emergencies includes children?s higher education or marriage, treatment of critical illness for self, spouse, children or dependent parents, construction or purchasing the first house and in case of fatal accidents. Also, no withdrawal will be permitted in case the subscriber already owns solely or jointly a residential house or flat other than ancestral property. Though each withdrawal required a gap of five years but this condition is not applicable in case of critical illnesses. Earlier NPS has prescribed the age of retirement to be 60 years but post-modification rules, corporate NPS subscribers can exit at an age designated for retirement by their employers. Some of the organizations have 58 years as the retirement age. 1. Once the subscriber attains the age of retirement, he has to buy annuity plans (pension product) for atleast 40% of the accumulated corpus from the Government Authorized agencies. He can withdraw remaining 60% of the accumulated corpus in lump-sum or in phased manner. If the subscriber don?t want to avail this default option of NPS, than he can take any of the following actions. 2. He can opt to extend the time to buy the annuity for 3 years from the date of turning to 60 years of age. This relaxation in exit rule is a breather for the subscribers who have a major portion of their contributions in the equities. If market is going from a rough phase at the time of his retirement, he can postpone his to annuitize his corpus. He can do same by writing to the concerned authority 15 days prior to his retirement. But, remember, in case of death of the subscriber happens in between the deferment period, than his spouse must buy the annuity. 3. He can defer the withdrawal of 60% till the age of 70 years. He can also make fresh contributions till he reaches to 70 years. After this he will have to withdraw the amount either in lump-sum or in phased manner. He can do so by writing to the concerned authority 15 days prior to his retirement. Earlier, even if subscriber deferred the annuity, no fresh contributions were entertained but under new norms fresh contributions till the age of 70 years are allowed. Further, in case of deferment of any kind, the subscriber has to bear the cost of maintenance of Permanent Retirement Account, including the charges payable to the central record keeping agency, pension fund, Trustee Bank or any other intermediary, as may be applicable from time to time. 1. In case the subscriber wishes to leave NPS before attaining the retirement age, he needs to buy pension plan for the minimum of 80% of the accumulated corpus. The remaining 20% is available for withdrawal after such utilization. The same is applicable post-modification but an exception has been made for smaller investors. If the accumulated corpus is equal to or less than Rs.1 lakh, the subscriber can withdraw the entire corpus without purchasing any annuity plan. Further, if the subscribers dies before attaining the retirement age and the same concept of 80% into annuity and 20% in lump-sum applies but if the corpus is less than Rs.2 lacs than the same is withdrawable by his legal heirs without going for any annuity plans. 2. If after attaining the Retirement age, the accumulated corpus is less than or equal to Rs.2 lakh, than the subscriber can withdraw all of it and is not require to purchase any annuity plan. Once an annuity plan is purchased, the option of cancellation and reinvestment with another annuity service provider or in another annuity scheme shall not be allowed unless the same is done within the free-look period specified by the service provider. Currently, 10% of the salary contributed towards NPS qualifies for tax deduction up to Rs.1.50 lakh under section 80CCD (comes under section 80C). In addition to this, budget 2015-16 has also allowed an additional tax exemption of Rs.50,000/- under Section 80CCD to encourage investors. 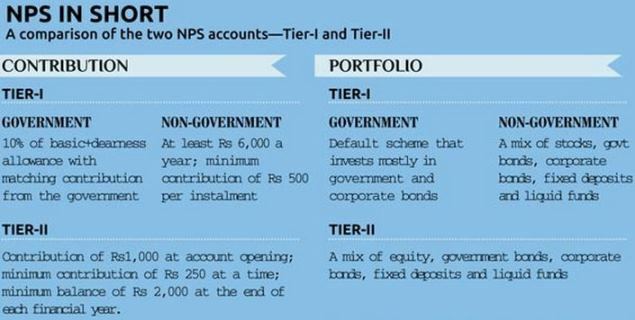 So in total you can invest Rs.2 lacs into NPS. The lump-sum amount received from the NPS after retirement is taxable in the hands of the subscriber under Income from Other Source while the pension receivable from the NPS is taxable under the head of salary. Though the new norms have relaxed the stringent laws of NPS but what it still remains to address that if subscriber switches job from Government sector NPS to private sector NPS whether the subscriber has to exit from the NPS and 80% of the corpus annuitized and open a fresh account in the private sector or his NPS account gets transferred from Government to private as happens in EPF. You should not get hampered by the relaxation in NPS withdrawal and exit rules because all the specified emergencies for partial withdrawal are long-term goals with atleast 10-15 years timeline and should already be taken care of by following?simple financial planning. Even if you start investing at 35 years of age, most of these goals would be achievable by creating a balanced portfolio consisting equity mutual funds, PPF, NSC and gold. Expense for your children education and marriage can be met simply by building corpus through long-term debt oriented funds such as PPF, Sukanya Samriddhi Account etc. Similarly, your dream of owing a house shall be fulfilled by home loan which also gives tax benefits. As for medical emergencies, health insurance policy with a family floater option would be sufficient. Thus one should not withdraw corpus from NPS before the maturity. With allowing this partial withdrawal from NPS account it has become more liquidity friendly. I quit my central govt job. I am not working now. I have 4 lakh in my NPS account. I cannot contribute any money since i am not working now. Will my NPS account get frozen after 1 year ? If so, whats the step to cancel my NPS account ? I have NPS account from last 1 year and balance is around 9000, i want to exit/close NPS account.I want to know that can I get my money back from NPS? and what is the procedure to close NPS account? If I understood you correctly, you meant that your NPS balance as on completion of your 60 years is 10L. Max % for lumpsum withdrawl is 60% so 6L you can withdraw that but it will become your taxable income. Rest 40%, 4L should be used to buy an annuity plan.